NETWORK FINALS: Game 7 of THE WORLD SERIES had a healthy adjustment up to 8.2, although that was still quite a bit below 2016’s 12.6 final for Game 7. 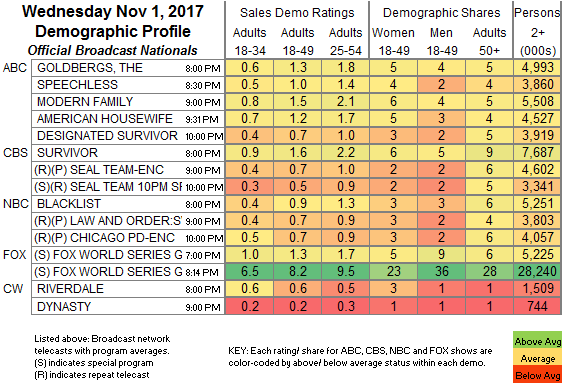 Elsewhere, SURVIVOR, THE BLACKLIST, THE GOLDBERGS and SPEECHLESS gained 0.1 in final numbers, while the 10PM rerun of SEAL TEAM lost the same. CABLE HIGHLIGHTS: VH1’s BLACK INK CREW took the Wednesday cable lead, up 0.08 to 0.59. Bravo’s REAL HOUSEWIVES OF NEW JERSEY was steady at 0.43. On HGTV, PROPERTY BROTHERS jumped 0.11 to 0.36, HOUSE HUNTERS gained 0.02 to 0.27, and HOUSE HUNTERS INTL was down 0.05 to 0.22. ESPN’s NBA doubleheader was at 0.35/0.31. OWN’s QUEEN SUGAR held at 0.35. TBS’s FULL FRONTAL slipped 0.02 to 0.34. MSNBC’s RACHEL MADDOW SHOW led cable news at 0.34/0.54/2.7M, over Fox News’s TUCKER CARLSON TONIGHT at 0.31/0.47/2.9M, and CNN’s ERIN BURNETT OUTFRONT at 0.26/0.33/1M. On Discovery, MISFIT GARAGE ticked up to 0.33, and GARAGE REHAB was down 0.07 to 0.28. 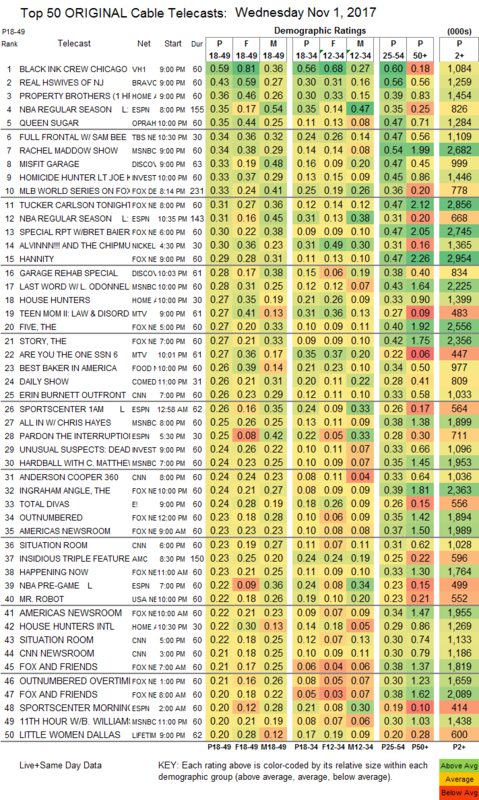 On ID, HOMICIDE HUNTER ticked up to 0.33, and UNUSUAL SUSPECTS was up 0.03 to 0.24. Nickelodeon’s ALVIN & THE CHIPMUNKS was at 0.30. On MTV, TEEN MOM rose 0.06 to 0.27, and ARE YOU THE ONE was down 0.07 to 0.27. Food Network’s BEST BAKER IN AMERICA was steady at 0.26. E!’s TOTAL DIVAS returned at 0.24. USA’s MR ROBOT climbed 0.04 to 0.22. Lifetime’s LITTLE WOMEN: DALLAS dipped 0.03 to 0.20. On Tru, INSIDE JOKES was at 0.19. FXX’s YOU’RE THE WORST bounced back by 0.05 to 0.11. On BET, FACE VALUE and 50 CENTRAL were at 0.08/0.08, respectively down 0.01 and steady. Spike’s SHANNARA CHRONICLES dropped 0.02 to 0.07. STAN AGAINST EVIL returned to IFC at 0.06 and an off-the-chart 0.05/152K. The finale of Sundance’s LIAR ticked up to 0.02/132K.